Most of us probably don’t remember how we learned that certain things we encountered in our youth were dangerous to touch. Those of us who became parents are more likely to recall how we taught our children to avoid open flames, matches, and the toaster. Unfortunately, most of these warnings aren’t really taken seriously until the person, young or old, touches a surface and discovers how hot it is and gets burned. We remember the pain, the wound and sometimes the scar. For business owners, posting warnings about hot surfaces in the work place isn’t enough. There’s a way to reduce or eliminate these burn injuries resulting in lost time, medical expenses, and even the morale of the employees. 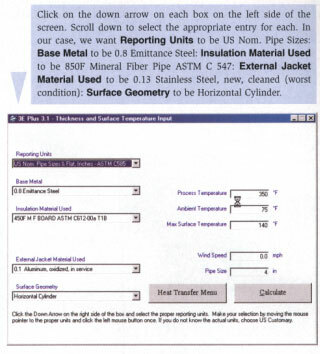 The ASTM Standard Practice Determination of Skin Contact Temperature from Heated Surfaces Using a Mathematical Model and Thermesthesiometer, C 1055, defines several kinds of burns. A first degree burn is defined as "the reaction to an exposure where the intensity or duration is insufficient to cause complete necrosis of the epidermis but no significant damage to the dermis. The normal response to this level of exposure is dilation of the superficial blood vessels (reddening of the skin)." A second degree burn is defined as "the reaction to an exposure where the intensity and duration is sufficient to cause complete necrosis of the epidermis but no significant damage to the dermis. The normal response to this exposure is blistering of the epidermis." A third degree burn is defined as "the reaction to an exposure where significant dermal necrosis occurs. Significant dermal necrosis has been defined in the literature as a 76 percent destruction of the dermis thickness. The normal response to this exposure is open sores that leave permanent scar tissue upon healing." The epidermis is the outermost layer of skin cells which contains no vascular or nerve cells and acts to protect the outer skin layers. It’s about 0.08 mm thick. The dermis is the second layer of skin tissue which contains blood vessels and nerve endings. It’s about 2mm thick. Necrosis is the clinical term applied to localized death of living cells. The length of time that human skin can contact a hot surface without pain or injury depends on the temperature of the surface and the thermal conductivity of the surface material. It’s generally accepted that 5 seconds is the maximum probable time for industrial situations that average human skin may be in contact with a hot surface resulting in a reaction no worse than a first degree burn. The objective for us then becomes controlling the surface temperature of the hot surface somewhere in the range of 44 degrees Celsius (C) and 59 degrees C. For those of us not yet attuned to the Metric system, the range is 111 degrees Fahrenheit (F) and 139 degrees F.
One of the reasons thermal insulations are used is for personnel protection. Putting insulation, with its protective jacketing, on a hot surface increases the total thermal resistance of the system and therefore the exposed surface temperature will be reduced to a level below that of the uninsulated surface. Once again we’re faced with the task of making some design recommendations on what insulation material and jacketing to use, and selecting the insulation thickness. Since this solution depends on the value of the exterior surface temperature of the insulated system, we must first understand that the "worst case" service conditions must be established. This means that we must specify the ambient temperature as the maximum expected during summer conditions for outdoor and indoor exposures. It also requires that we assign a wind speed velocity of 0 miles per hour (mph). Then we must determine the maximum service temperature that the system will see in service. It’s my preference to select a lower surface temperature maximum based on whether or not the protective jacket is metallic. When the jacket is metal-such as aluminum or steel-the thermal conductivity of the metal is quite high, thereby quickly transferring heat to the skin on contact. This being the case, it seems prudent to specify a maximum surface temperature closer to 130 degrees F than to 140 degrees F when the insulated surface is protected by a metallic jacket or facing. Another point of interest deals with the emittance value for the jacket material. Low emittance values (0.03 for shiny aluminum for example) yield a higher thermal resistance for the outside surface film, and a surface temperature closer to the operating temperature (higher) in turn requiring a greater insulation thickness to meet the design surface temperature criteria. There are many jacketing treatments available. Lastly, the thermal insulation material must be selected. 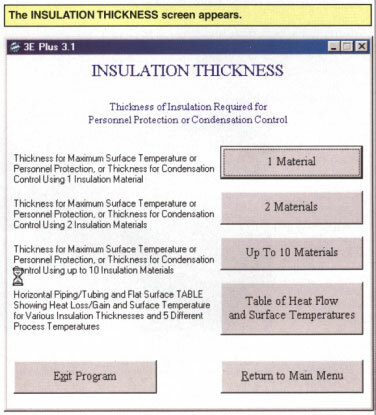 The thickness required for personnel protection is directly proportional to the thermal conductivity of the insulation. There are many thermal insulation materials that are suitable for service on pipes, vessels, and equipment operating at temperatures up to 1,000 degrees F and higher. It’s not within the scope of this article to specify either the insulation or the jacketing material. This part of the solution depends on good communication between the owner, his engineering department and the insulation contractor. There will be preferences and other requirements resulting in the selection of the insulation material and the jacket treatment. Let us establish the "job" conditions for an example of how to determine the insulation thickness to provide personnel protection. We have a bare horizontal 10-inch IPS steel pipe located outdoors in an eastern state in the United States. The pipe is carrying saturated steam at 400 degrees F, and it’s at a 4-foot elevation adjacent to a well used walkway. The owner stated his preference for mineral fiber insulation with a field applied stainless steel jacket. Since the jacket is to be metal, the decision was made to set the maximum allowable surface temperature at 133 degrees F, and the worst case exposure was agreed to be 110 degrees F ambient air temperature and 0 mph wind velocity. 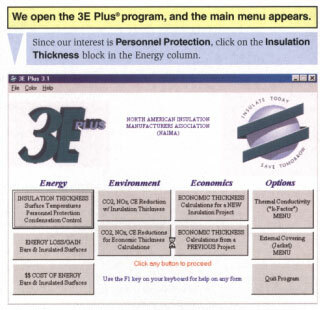 Beginning on page 10, the 3E Plus® computer program illustrates how easy it is to determine the insulation thickness required to reduce the surface temperature to a value below the specified maximum for personnel protection. 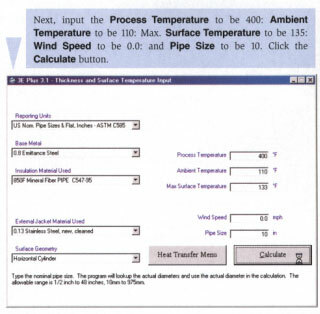 If this sophisticated program for calculating insulation thickness for economics, process control, condensation control, and personnel protection is unfamiliar to you, visit www.pipeinsulation.org to learn more about the newest version of this program that has been in widespread use by the thermal insulation industry for more than forty years. We open the 3E Plus program, and the main menu appears. 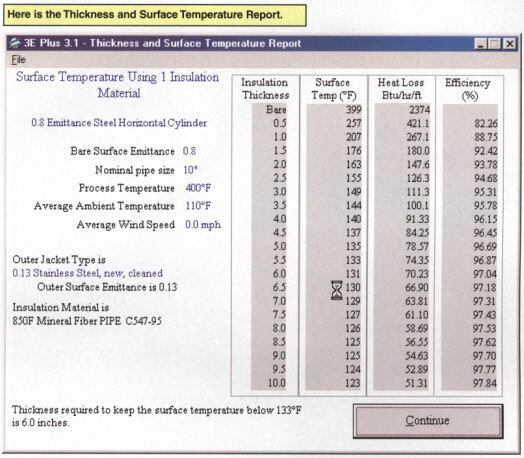 The INSULATION THICKNESS screen appears. Here is the Thickness and Surface Temperature report.